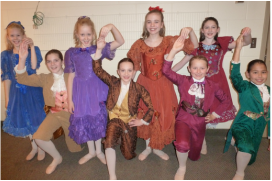 Pas de Deux Dance Studio was excited to host the youth dancers for the Moscow Ballet's Great Russian Nutcracker! * $50 casting fee if selected for a role. Please make checks payable to Pas de Deux Dance Studio and bring them to the audition. Each dancer will know if they have received a role by the time the audition is complete. * All Pas de Deux students must have their accounts paid in full before auditioning. * Please review the costume information at www.nutcracker.com/youth-auditions/faq-for-students. All dancers are required to provide their own tights, shoes and leotards for under costumes. * Dancers should be dropped off for the audition due to limited parking. Rehearsals will begin immediately following the audition for some dancers. Dancers should bring a cell phone if possible to let parents know when they are ready to be picked up. The latest we will go is 8:30 pm. * Bring your ballet shoes (and pointe shoes if applicable) to the audition. * Dancers will know their roles by the end of the audition. Dancers who do not have immediate rehearsals will come back on Tuesday to learn their role. Rehearsal Schedule is subject to change based on which roles are cast to make the best use of everyone's time. * Exact times will be given to dancers for these dates once they are cast and we know which roles have been filled. Some Variation Dancers may have earlier rehearsals if they are available to be at the studio. * Variation rehearsals for September and October will be scheduled after casting is complete. * Performance day includes costume fittings, a photo shoot, an onstage dress rehearsal of the children's roles with the professional cast, and the performance itself.